While my recent commentary (here and here) demonstrates Australian housing is in a bubble, I have not explained where this situation has come from. Asset markets, in this case, property, are the subject of speculation based upon the delusional premise that past price rises will continue indefinitely into the future, with no chance that a downturn will occur. The dream of creating and realising capital gains has prompted ever more Australians to participate in the property market as either first home buyers or investors (speculators). Incomes rise too slowly and savings are too low to inflate a bubble into the stratosphere. Another ingredient is needed: mortgage debt. Property is not bought for the rental income stream it provides because this is insufficient to finance the debt used to purchase property at inflated prices during a bubble. As prices are bid up, owner-occupiers and investors take on ever-increasing amounts of mortgage debt, supplied by banks and other financiers. This creates an upwards spiral of increasing prices and debt, leading to a housing bubble (aslo known as a pyramid or Ponzi scheme). Australians have shouldered a mountain of debt, readily supplied by the banking system. Mortgage debt currently stands at $843 billion and $359 billion for owner-occupier and investment properties, respectively, for a combined total of $1.2 trillion or approximately 90% of GDP in 2011. A report by the Bank of International Settlements shows that a ratio of 85% or more becomes damaging to the economy. The clearest indicators Australia has a housing bubble are the sky-high prices in relation to fundamentals (inflation, wages, GDP) and that the average investment property generates a negative yield. Since 2000, rental income has not even covered interest charges. No rational individual purchases an asset that generates a net negative yield – but clearly speculators have been pursuing capital gains instead. It is important to note it is the land component, not the structure (which depreciates), that increases in value during a bubble. Economist Hyman Minsky was the first to show that asset bubbles were the natural consequence of unregulated financial markets. His “Financial Instability Hypothesis” explains how this occurs, recognising markets are endogenously (internally) inefficient. The Australian economist Steve Keen is a prominent advocate of this view. 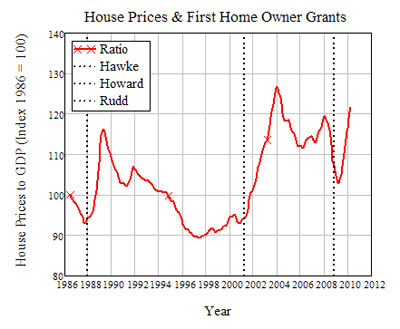 First Home Owner’s Grant (FHOG): almost certainly leads the pack in inflating housing prices. Capital gains tax (CGT): in 1999, the Howard government enacted a 50% tax cut on a property if it was held for at least one year. Negative gearing: taxpayers subsidise landlords on the premise that it will increase the number of rental properties on the market, allowing part of the loss to be written off. First Home Saver Account (FHSA): designed to encourage first home owners to accumulate a sizeable deposit through a combination of government contribution and individual savings. Few first home buyers made little use of the program. Travel write-offs: landlords are allowed to claim tax deductions on travel expenses to their investment properties. Other exemptions/reductions: owner-occupied housing is exempt from imputed rent, capital gains and land value taxation. Moral hazard: The big four banks have 80% of the Australian market between them. Each is too big to fail and jail. They have issued debt with impunity, so when the financial system implodes, the government must bail them out. Residential Mortgage-Backed Securities (RMBS): the government supports non-banking mortgage lenders that would not otherwise lend or at least lend below current levels by purchasing these securities. Bubble denialism: by claiming there is no bubble – and supporting this assertion with extensive and quite mistaken analysis - the government, along with industry, has maintained the illusion everything is fine, thus deceiving ever more Australians into the property market. The figures regarding the property market are staggering. Negative gearing has been criticised, though nobody appears to have figured out how much it costs the Australian taxpayer. By examining the last 16 years of tax office records, I’ve calculated that negative gearing has cost us an aggregate $29.3 billion over this period. The Senate report on housing affordability aggregates tax exemptions for property owners: $53 billion per year for 2007-08; add another $1 billion per year for the FHOG. This is equivalent to almost one fifth of federal tax revenue in 2008. If property owners were to pay a land tax equivalent to the annual imputed rent they privately capture, it would replace all of Australia’s 125 inefficient taxes that burden business, labour and consumers. It is widely recognised that land value taxes are the most efficient (little to no deadweight loss). Land valuer Bryan Kavanagh estimates that publicly generated rent stemming from land is on the order of 32% of GDP in 2005. The non-payment of approximately $300 billion per year is a massive gift to property owners. ABS statistics show that the value of residential land has risen from $586 billion in 1996 to $2.8 trillion in 2010. This has allowed property owners to privatise trillions in capital gains over the last 15 years. Given these figures, it comes as no surprise that the government treats property as a sacred cow. So who benefits? The landed gentry (large property owners), established owners and speculators gain the most. First home buyers, renters, tax-paying businesses and workers are severely disadvantaged by our insane taxation system. Our system, however, has one advantage. Australians willingly enter a lifetime of debt slavery, whereas Egyptian slaves were forced. As the bubble-predicting economist Michael Hudson has written, amassing paper wealth through speculation does little except to ensure that the public remains on the road to serfdom. The only way out of the ensuing mess is to cut down debts to the ability to pay, as those who can’t, won’t.